Wondering what cooking utensils and appliances to get for your camping and touring needs? Check out what we got and what our thoughts are. It might give you some ideas as to what will suit you when you’re travelling the outback. MSR Flex Skillet – an extra frying pan that we got that nests inside our Flex 4 System so it doesn’t take up anymore room in the hilux. Includes an extra handle. MSR Alpine Dish Scraper/Brush – nonstick- dish cleaner features a rubber grip, an edge radius to scrape off food and a stiff-bristled brush for cleaning (saves water too). We are happy with our MSR cookwear and utensils. It is handy having two saucepans and a pan/skillet. We have used all three at once for some cookups. The mugs are insulated and keep hot drinks hot while preventing spillage and keeping dust and bugs out. The saucepan handles feel a bit flimsy when the pots and pan are full and the clip on connections have become slightly looser with long term use. They’ve lasted a year of full time use, hopefully they continue to last. The best part about this system is that it is lightweight and doesn’t take up much space, but I’d prefer the handle mount to be sturdier even at the expense of some weight. The scraper works well for washing the dishes. We scrape off most of the grime with the edge of the dish scraper, after which we need just a small amount of water and detergent to remove the remaining oily residue. It saves water and means we don’t need to store away a mouldy wet sponge when we pack up camp. Thermomix – a kitchen appliance that performs over 10 cooking functions in one compact unit. This is camping exuberance. Banana smoothies, boiled water, steamed veggies, minced garlic, grated cheese and home made peanut butter all at our finger tips on any camp anytime! Most functions are not energy hungry but when you want to use the heating function we need to run the motor to ensure our car battery is not depleted. Not a big deal though as usually we use our other appliances to heat our food. It only takes a couple of minutes to boil water in it so no big drama running the motor for that period. 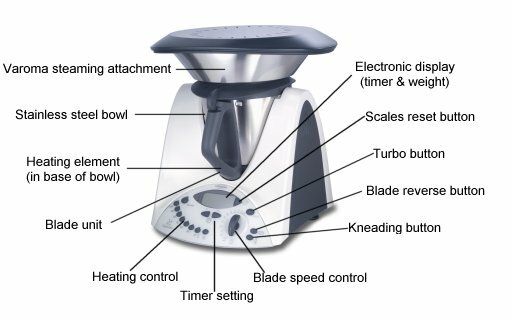 Click here for our detailed thermomix review. Wood Gas Burner XL – gassifying wood burning camp stove. You can easily cook using as little as a bunch of twigs! It has an integrated fan in the bottom which forces air through the unit and provides a clean, hot burn. A nice way to efficiently use poor quality fuels like leaves and twigs to create a strong clean flame. 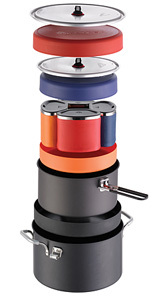 High output combined with low smoke and soot means it is a great cooking stove. Leaves very little soot on pots if at proper operating temperature. It can however be tedious to light and can go out if not started correctly or the fuel is not kept topped up. We haven’t used this as much as we would have liked, mainly because we haven’t mastered lighting it and it would often go out and start smoking. It needs to be started in a way that produces a strong burn straight away. 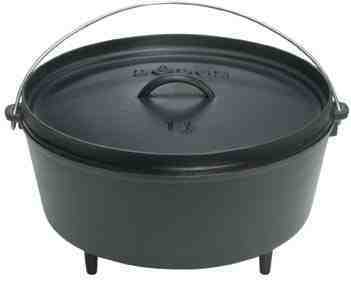 Lewis & Clark Seasoned Cast Iron Dutch Oven / Camp Oven – for roasts, bread, dampers, chocolate brownies and long, slow cooking like stews. Sharni’s camp oven roasts have garnered a reputation for being some of the best roasts ever tasted. We were always blown away by the roasts cooked in the Camp Oven. A very nice way to cook a meal whilst camping. The process of cooking this way is satisfying and the anticipation builds as it slowly cooks over a couple of hours. Crank the fire. Prepare the roast. Chuck it in the hot coals and sit around the fire enjoying a drink, the bush TV and the smell of a cooking roast. Make sure you get one with a lip on the lid to prevent embers and ashes from falling into the oven. 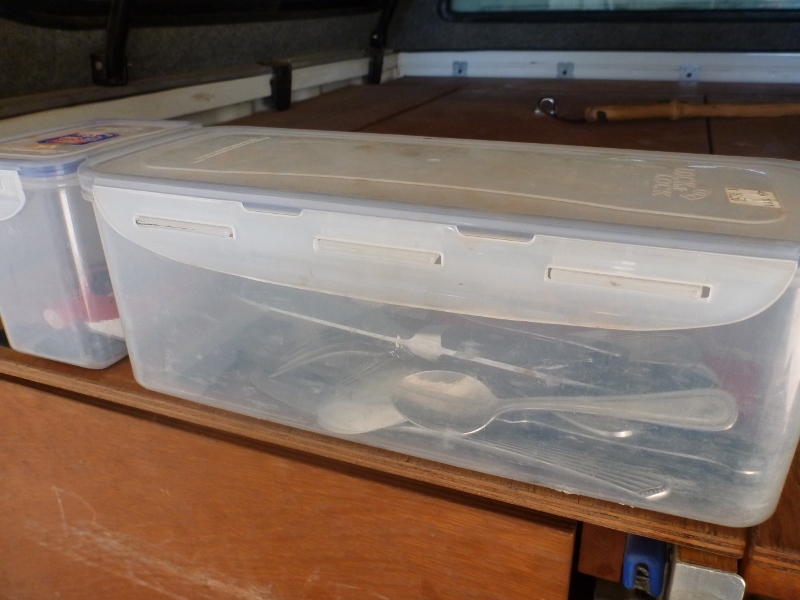 Ours also came with a special hook for lifting the lid – it’s more stable than using pliers or other improvised tools. Cast Iron Hot Plate – Simple, effective and cooks a delicious BBQ. Used to be the only thing I’d take camping during the old days in the Sierra, along with my spatula of course. Chuck it on an open fire and cook up some of the best bbqs you’ve ever had. 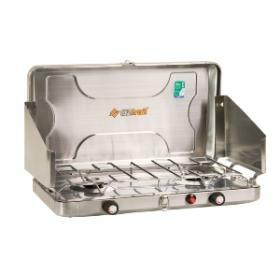 OZ Trail Gas Stove – stainless steel oversize 2 burner stove. 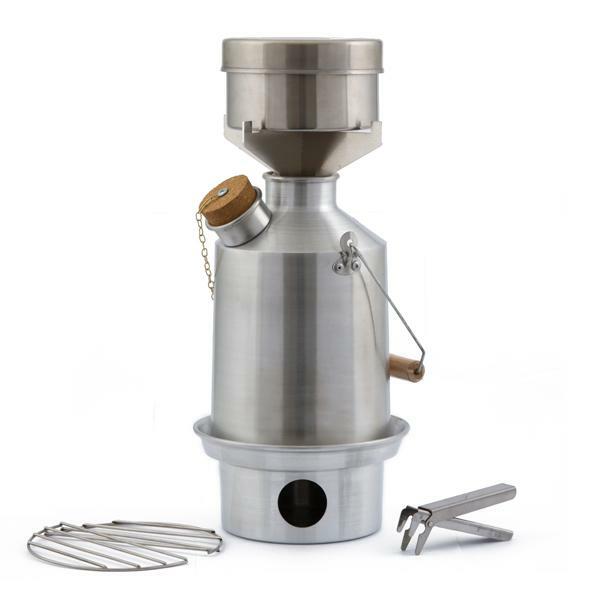 We prefer to use the Kelly Kettle, Wood Gas Stove, Camp Oven or the Iron Hot Plate because the fuel is free, carbon neutral and a fire creates a great atmosphere for camping. Joe also enjoys preparing and maintaining fires. However the gas stove works well and is a good reliable backup when we can’t be bothered lighting fires or fires are not allowed. Construction is strong, quality is good. The press button ignition spark works well, the heat level is strong and adjustable and easy to clean. The knobs are a little sticky, meaning you need to overshoot the desired position, when you let go of the knob it goes back a little bit. One annoying thing is the storage of the 4.5kg gas bottle. It needs to be stored outside for safety reasons which is not easy when not towing. The only place for our gas bottle is on the roof which can be annoying to remove, especially at night. Kelly Kettle – a highly efficient 1.1 litre aluminium kettle, cook set and pot support which all fit neatly together into their own drawstring carry bag. 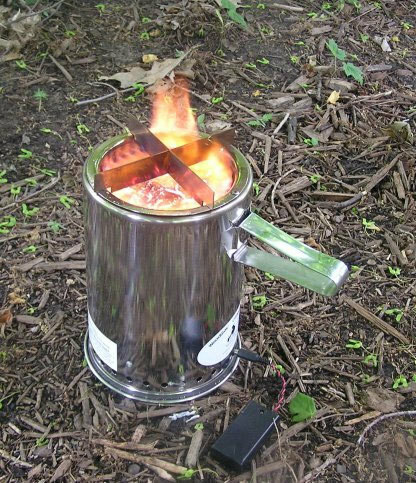 Using any naturally occurring solid fuel (sticks, pine cones, dry camel dung) to make a quick, easy and contained fire to boil water and heat food. Joe loves the Kelly Kettle, being able to make hot cups of tea quickly and easily first thing in the morning using only poor fuels like leaves and twigs is heaps of fun. 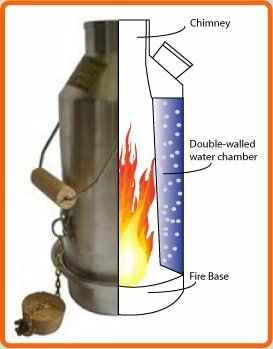 He likes the simplicity and efficiency of the Kelly Kettle design and the fact the fuel is free and so readily available even when good fuel has been depleted in popular camping areas. Chuck the fuel in the fire base, light it up and put the kettle on top. In a few minutes it’s boiled. The pot can mount on top of the kettle to heat food whilst heating water, or the kettle can be removed with the pot placed directly on the fire base. This is good only for gentle heating, since the fire is only small. We’ve used it to fry a couple of eggs and sausages, took a while though. Billy / Billycan – an aussie icon, the billy is good fun to use and convenient when the camp bbqs are provided with a billy support over the fire. Nothing like putting the billy on the boil whilst camping in the outback. 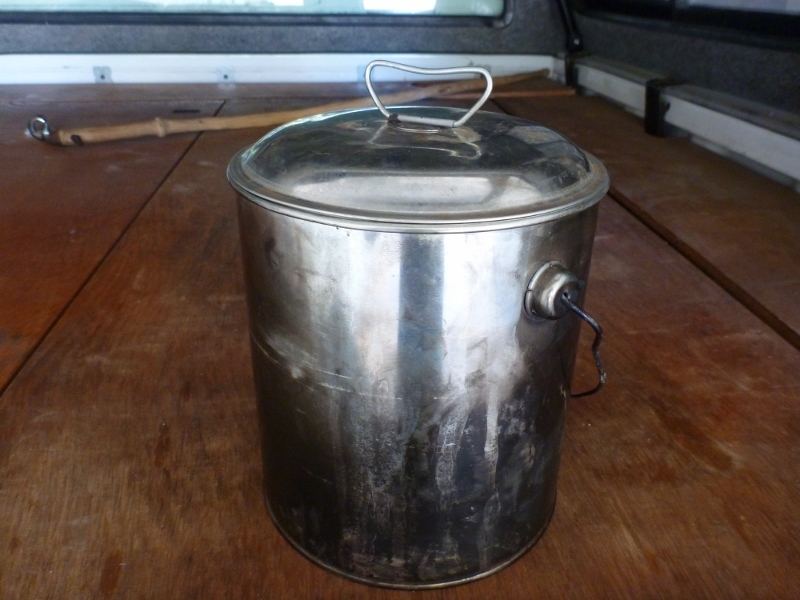 Ours is a 3.5L medium sized billy, big enough to cook up a meal for a few people. When there is no billy support provided, using a billy gives the men a chance to practise their bushcraft skills by fabricating a tripod and hook to support the billy over the fire. Good fun. For boiling water we usually use the kelly kettle because it’s faster and uses less fuel, unless we already have a good fire cranking and a billy support. Granddad’s Knife – Every kitchen needs a flagship knife. I inherited this knife off my granddad. He used it for cutting meat and making sausages. It’s made of carbon steel so doesn’t look the best, but it sharpens to the sharpest edge I’ve ever seen on any knife, and holds it well. Really good knife. We use it for cutting meat, fruit and veggies. It’s pretty old and I’m not sure where you can buy Granddad’s knife from these days. Polysafe Polycarbonate Glasses – good looking, strong, almost unbreakable and a bit of a novelty when touring around Australia, especially if you’re used to cheap disposable plastic cups like I am. Using these glasses makes you feel a bit more like you’re at home. I’ve dished up some scotch on the rocks in the small tumblers and really felt like I’m living it up, especially when on a beautiful remote beach in the middle of nowhere. Polysafe are a good brand used in some pubs that have replaced all their glassware with these. The polycarbonate will scuff if left resting against something hard whilst driving offroad so should be stored carefully to avoid that. These glasses are thick, strong, look the part and are enjoyable to use whilst on camping missions. 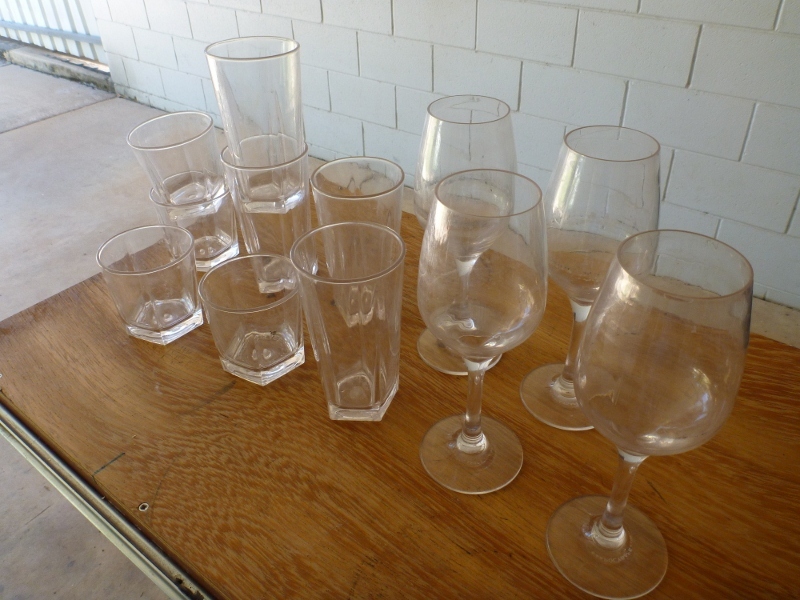 We have too many glasses, thinking we’d need them for camping dinner parties and such. Haven’t really had a need for this many glasses, might need to cull a few at some stage. 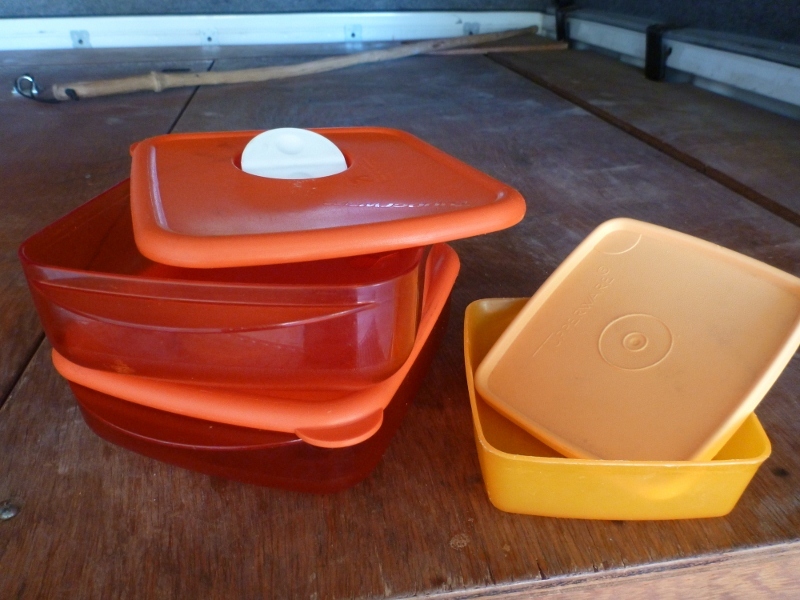 Tupperware containers – we use these for storing leftovers and for using microwaves when we are camping in caravan parks, as our other dinnerware is not microwave safe. 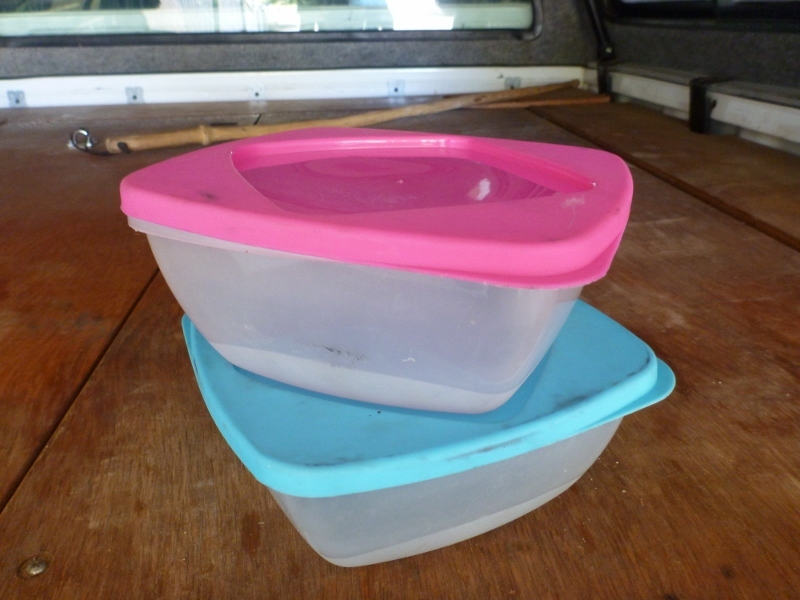 Cheap plastic containers – we bought these a couple of months into our tour around Australia, as we found the couple of tupperware containers weren’t enough. Sometimes we’d use a container or two for freezing some fresh fish or leftovers, which meant we had nothing left for any further leftovers. So we got these cheap containers from the red dot store in Esperance. Pretty flimsy but they’re cheap, lightweight and work ok as a backup container when we’re camping. 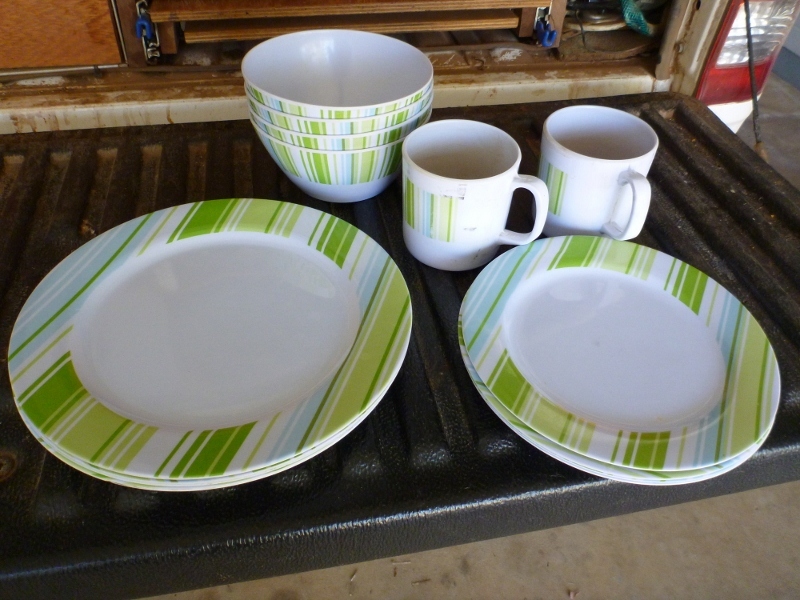 Melamine Dinnerware – we bought a melamine dinnerware set for touring and camping our way around Australia. Melamine is much harder than other plastic dinnerware, so you get less scratches, less knife gouging and less stains and they feel more like proper dinnerware. They also don’t chip easily like we’ve heard can happen with enamel dinnerware. One draw back of melamine is because of its hardness, it is more brittle than other plastics and so can crack easier, which we found out on one camp. This set came with a large mixing bowl but it broke when we dropped it on some rocks. I think the other items are less likely to break when dropped because they aren’t as heavy as the mixing bowl. Melamine also isn’t microwave safe – it can release toxic substances. We rarely use a microwave, only the odd occasion at caravan parks (couldn’t fit one in the Hilux kitchen). We use the tupperware plastic containers when microwaving. 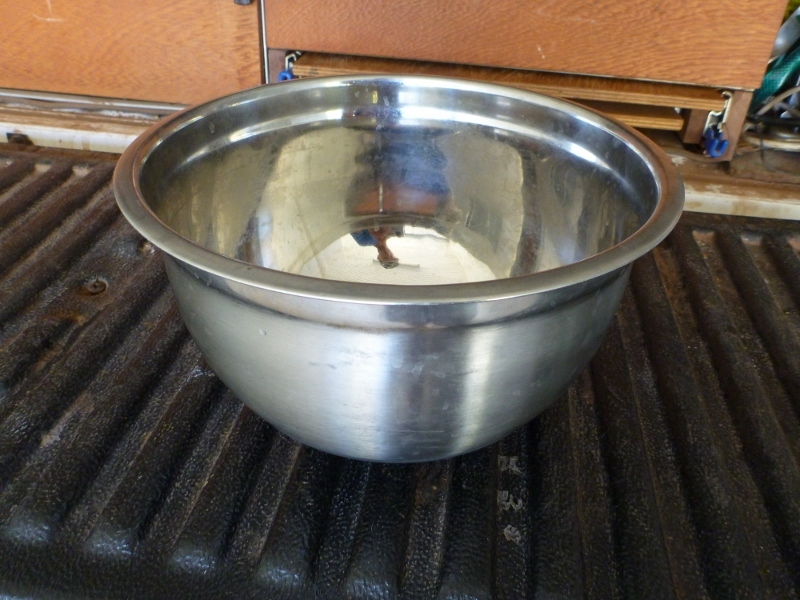 Stainless steel mixing bowl – after our melamine mixing bowl broke we picked up this one cheap at Kmart in Darwin. It mainly gets used for salads, and the occasional batch of dough. 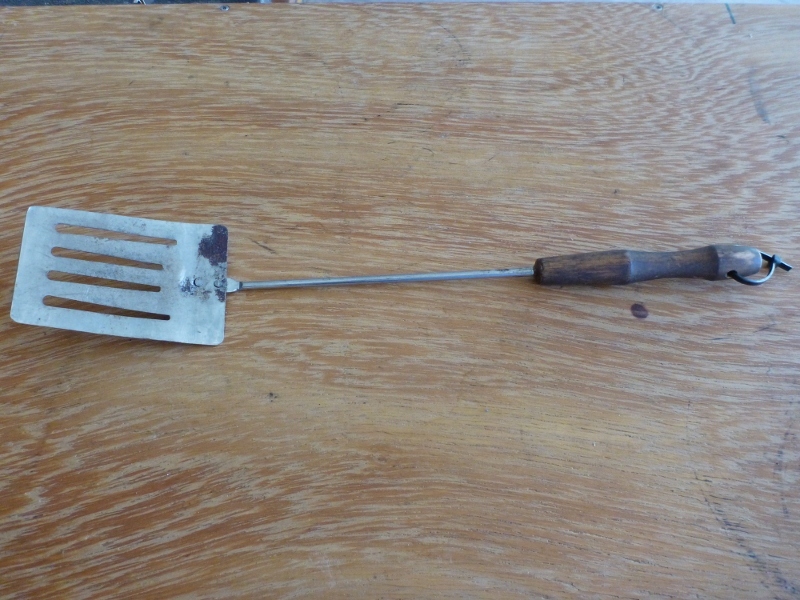 Spatula – the ultimate camping utensil. Used to be the only utensil I needed when roughing it in the Sierra. It is so versatile. Your one stop utensil shop. The most commonly known use for a spatula is of course opening beer bottles, but there are many other uses. Check out my spatulacraft page for more info. 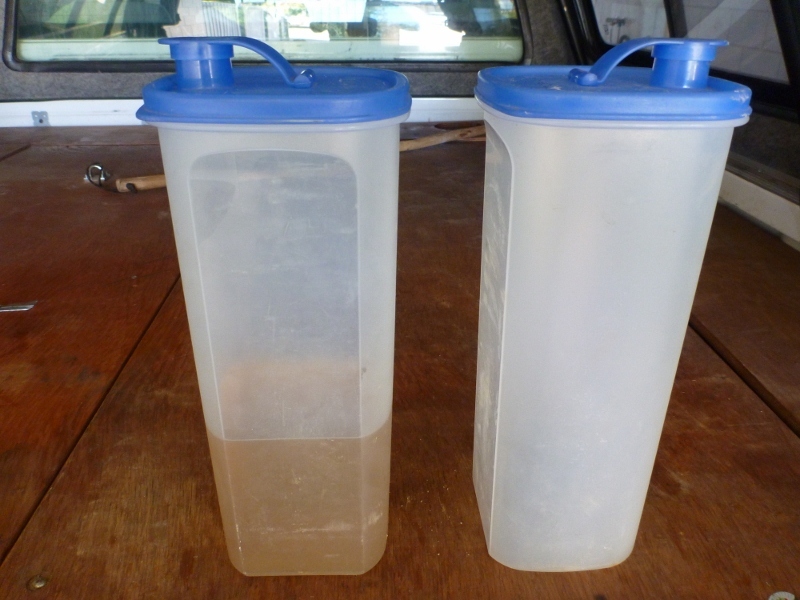 Tupperware Jugs – we use these for cold water or cordial from the fridge. Sturdy and good space utilization because of their square shape. Snap Lock Containers – these containers house our most commonly used cutlery. They utilize the space behind our fridge, the fridge being set forward because of our sleek profile canopy. They are secured to the slide out fridge shelf with velcro. 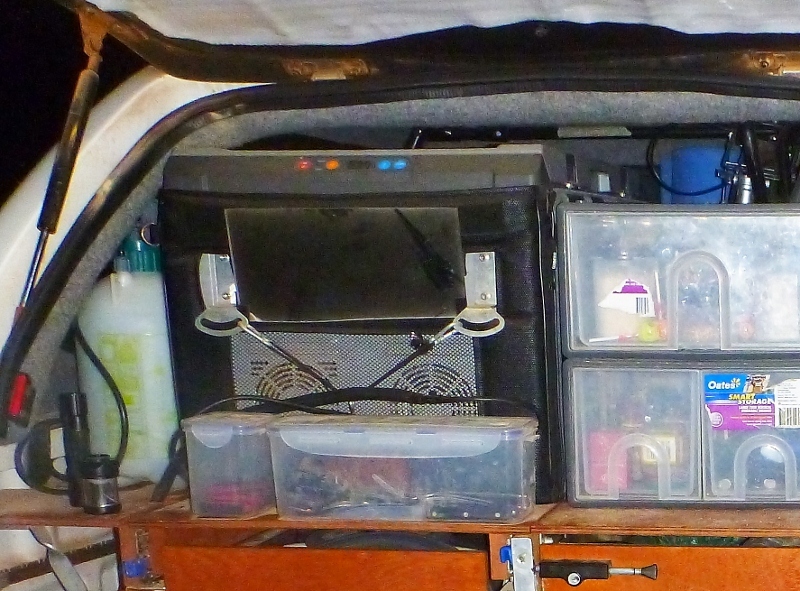 The small container to the left holds our MSR scraping brushes, some matches and a cigarette lighter. We are using standard cutlery, no special camping utensils. 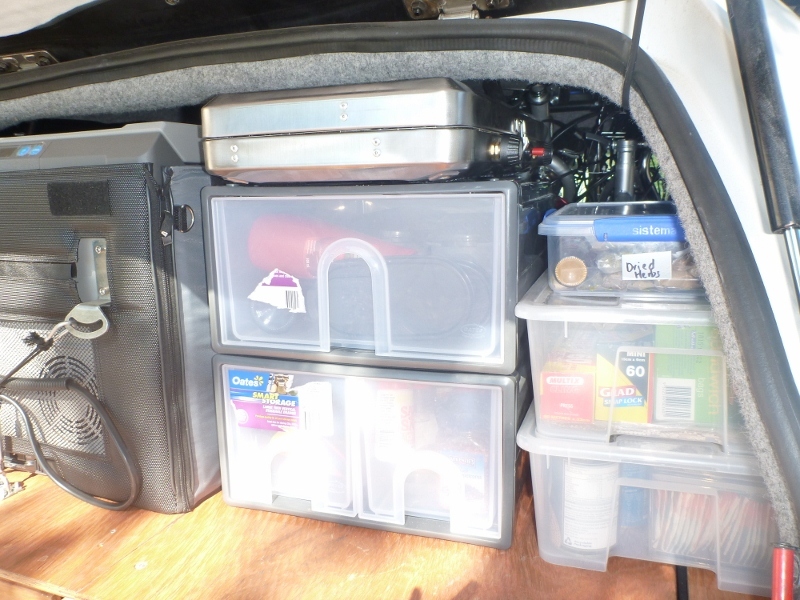 The Hilux Camping Pantry – a couple of Oates plastic stackable drawers, a couple of ikea plastic containers and a snap lock container make up our pantry where we store dry foods, canned foods, herbs, spices, glad wrap and our bulky cutlery like large tongs and can opener. On top of the plastic drawers is the Oztrail gas stove, secured with velcro. 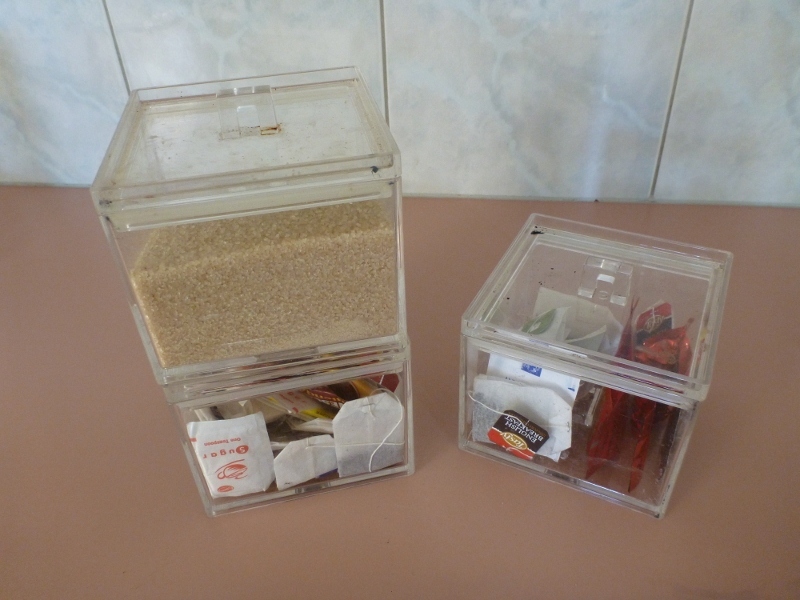 Stash canister stackable cube – used for tea and sugar. They are sturdy acrylic with a rubber seal on the lid which holds the lid securely down. Being square, it maximizes space and stacks nicely. We have another one of these for our laundry powder. They sit very well in our drawers. We got them from Freedom Furniture. Multi-Purpose Paper – an incredibly versatile addition to anyone’s camp kit. We never go on camp without some multi-purpose paper. Apart from being useful for starting fires, blowing your nose, soaking up spills, wiping down surfaces, women’s facial routines and even as a substitute for toilet paper, when we are low on water it’s an important tool in the kitchen for cleaning dishes. No water or detergent is required – simply rub your dishes with multi-purpose paper, replacing the paper as it becomes dirty, until your dishes are clean. The paper is amazingly absorbent and will not leave any oily residue at all. Your plates and cutlery will be sparkly clean without using any water or detergent. 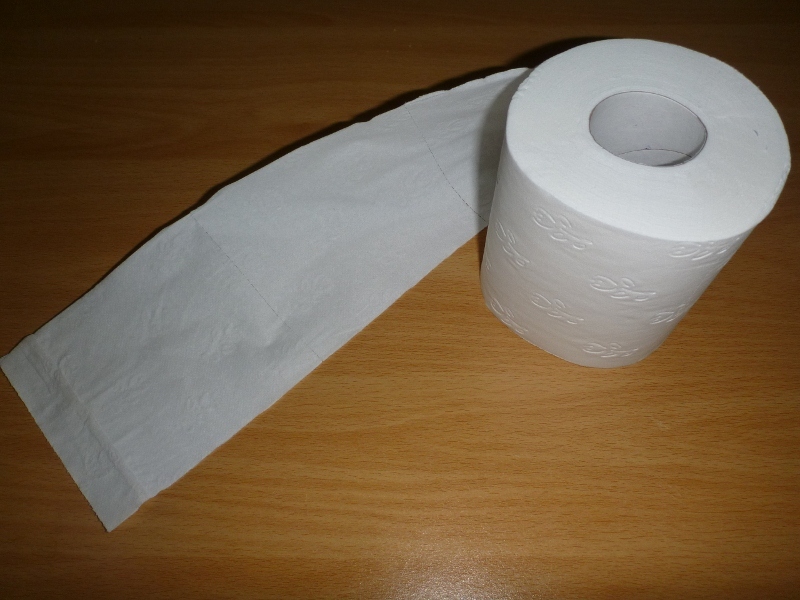 The used multi-purpose paper can then be discarded in the fire, adding to your fuel reserves and leaving no mess. Forget about expensive tissues and paper towels. Multi-purpose paper is cheaper and more versatile. Yeah since we had one I thought might as well take it. Banana smoothies on the beach are great. I’m going to do a specific article on thermomix camping one day, theres some interest there. Love this post… Found this while looking for thermomix reviews! 2. It leaves paper ‘dust’ residue when wiping dry pans. Heya blueprintyouth I use any multipurpose paper I can find, Sorbent is common. Whatever is cheapest. Try other brands if the one you are using is leaving paper dust on your pans. Great blog, I’ll respond to your Thermomix report in due course once I distill all my reinforcements of your arguments. This might give the missus the right / wrong idea but nothing on earth beats baby wipes. Engine oil, bearing grease, peppermint ice-cream – nothing will get the better of them. We found (have 3 small kids) that a ex-4L kitchen detergent pump bottle made the ultimate camp hand wash station, lasts for days and saves loads of water. To save space try a 1L aloe vera moisturiser container. If / when you get to Victoria give me a shout and I’ll let you know of the best campsites we have been to. I can also let you know what is happening on the instro engineering scene as well. Hey Paul baby wipes might be great but have you seen the prices of those things? You can buy bulk packs of 18 rolls of multi purpose paper for a few dollars. Plus it’s superior since it’s dry and can be used as tinder to light a fire. Suddenly you don’t need fire lighters either! Yeah we’ll get to vic one day, might be handy to get some hints. If anything like WA the engineering scene is pretty dire at the moment!